Today, Ed and I got to the shop early, 6:15 in the morning. we plugged away until 3:30 and are "close" to being done. I really think so. I really hope so. Again, a template was useful. 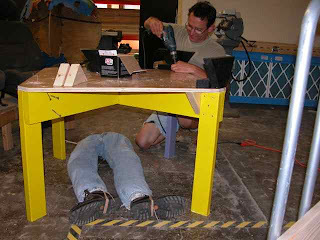 Below you can see me drilling holes using the template Ed created. 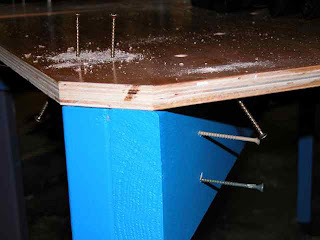 I placed screws in the pre-drilled holes so as to facilitate Ed's work as his was more complex and time-consuming. There are many examples of systems thinking in our work! 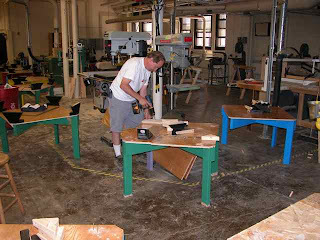 This picture shows Ed attaching the corner supports. You can see the shop mascot taking it easy in the chair. We finally got the mascot to help supporting the table from underneath, however he was not much help as he's missing his upper body. 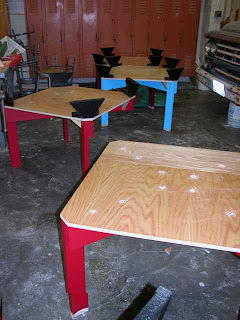 This picture below shows three tables ready to receive the glass frame. 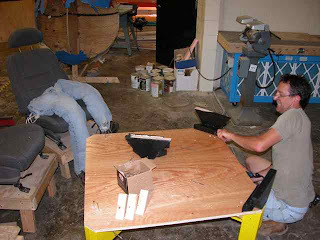 The table in the foreground illustrates how how the two-piece, sub-tabletop is screwed on to the table assembly.